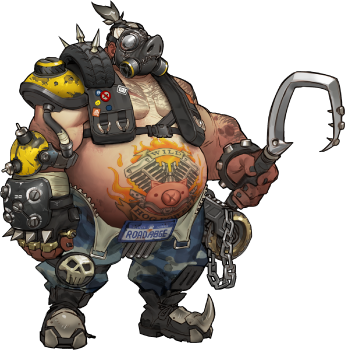 Roadhog is a strong tank hero thanks to his ability to heal himself and catch low hp offensive targets. These strengths are what make roadhog effective as a damage dealing Tank. Since the general strategy for Roadhog is to play around your Hook Cooldown, while staying alive with your heal. Roadhog does have a couple of Roadhog counters in particular. Reaper is a given since he can kill almost any tank hero, including roadhog. When it comes to tank versus tank hero Zarya is among the best Roadhog counters, due to her ability to deny the hook kill with her shield ability. Roadhog is a unique Tank. relying a lot of personal survivability thanks to Take A Breather ability and his massive base Health pool, he has nothing like Reinhardt or Winston’s barrier, making him a weak tank hero in terms of protecting his team from damage. Roadhog can hook D.Va ult to get it away from teammates and can hook Reinhardt right out of his charge. Generally, in Roadhog vs Roadhog, whoever hooks first loses because the guy who gets hooked gets to attack first. You can animation cancel most of his abilities into others. Reaper: Keeps popping up, for a good reason this hero in the tank slayer for overwatch. No tank can absorb his damage and survive aside from zarya thanks her to shields. Zarya: Is the best Tank versus Tank match-up in terms of Roadhog Counters. In this 1v1 you almost want to be hooked, or at least one of your teammates. Since you can apply an invulnerability shield to his hooked targets.